Parker BV Series Bleed Valves are designed for use on products such as multi-valve manifolds or gauge/root valves. Functionally, the valve vents line pressure either to atmosphere or to containment when used with the optional barbed vent tube. Generally, bleed valves are used whenever an instrument is removed from a system or to assist in the calibration of control devices. The BV Series is also recommended for use in bleeding hydraulic systems. 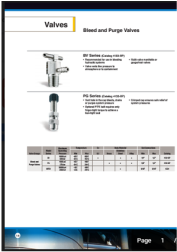 Parker PG Series Purge Valves may be utilized as either bleed, purge, or drain valves. The compact valve requires only a quarter turn with a wrench from finger-tight to ensure a leak-tight seal on the first make-up. Additional wrenching ensures a leak-tight seal up to the rated pressure. MPBV wellhead gauge and bleed valves are ideal for instrumentation calibration or sampling. Wellhead gauge and bleed valves are standard in 316 stainless steel annealed material and comply with NACE MR0175. Hanley Controls Clonmel Ltd. commenced trading in 1981 and is located at Gortnafleur, Clonmel, Co. Tipperary. We are primarily a Trading Company specialising in process measurement and control instrumentation, mechanical valves and pipe fittings. We also have a manufacturing section producing metering units, pipe assemblies, air distribution manifolds and specialist control panels. Copyright Hanley Controls (Clonmel) Ltd 2016. ISO Accreditation since April 1996.